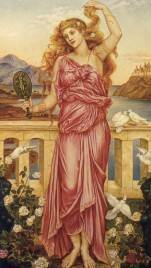 So let's see some Helen of Troy pictures - it's interesting how the different artists imagined the most beautiful woman in the world, the one whom all the kings and princes wanted to marry. In this painting I like the gown, but the face is in the shadow, so it's not very clear what she looks like. An ancient mirror, with her portrait as imagined in that time. Aphrodite/Venus keeps her promise to give Paris the most beautiful woman on earth. As we know, she decided to elope with Paris. Other say that it was goddess Aprodite who convinced her to follow Paris. Other artists call this an "abduction", but I guess it was consensual. A beautiful image of Helen and Paris, when they still loved each other. Let's see if you spot what's wrong in this painting. As you see, it represents Paris and Helen, with the statue of Laocoon in the background. But if the statue existed, it means the facts it represented had already taken place. That is, Laocoon was killed my the marine snakes when he advised the Trojans against introducing the Trojan horse. This episode happened at the end of the war, when Paris was already dead, and Helen was married to Deiphobos. When in Troy, she had an ambiguous behaviour, she helped both Torjans and Greeks. In other Helen of Troy pictures, she is represented on the ramparts of the city of Troy, maybe longing for the life she had left behind, maybe finally realizing the sorrow her whim had brought upon the others. When she finally met her real husband, Menelaus, he wanted to kill her, but when she dropped her gown, he was blinded by her beauty and just forgave her. For the story of Helen of Troy, click here.